As has been quite apparent by its promos, Simran is an out and out Kangana Ranaut film and the catress has done full justice to the trust placed in her by both her director and her fans. In addition to the leading lady, the movie also features Kangana Ranaut, Kishore Shahane, Hiten Kumar, Sohum Shah, Catherinne Dyer, Mark Anthony Justice, Evette Young and Robin Dyke. The movie, directed by Hansal Mehta, has been released in theatres on 15th Sep 2017. 30 years old Praful Patel (Kangana Ranaut), is a divorcee, living with her parents in Georgia, Atlanta. She works as a housekeeper and juggles between managing her complicated family life and her ambitions. While Praful’s father consider her to be a good-for-nothing, her mother is focused on getting her married again, But Praful has her own plans of gaining freedom by shifting into her own apartment. Then trip Las Vegas for a bachelorette party with her cousin, changes everything for Praful. She ends up losing all her savings, while trying her luck at a casino in the city. She tries to rectify the mistake by taking a large loan from a loan shark which unfortunately complicates matter further for her and soon she is in a deep criminal mess with seemingly no exit. 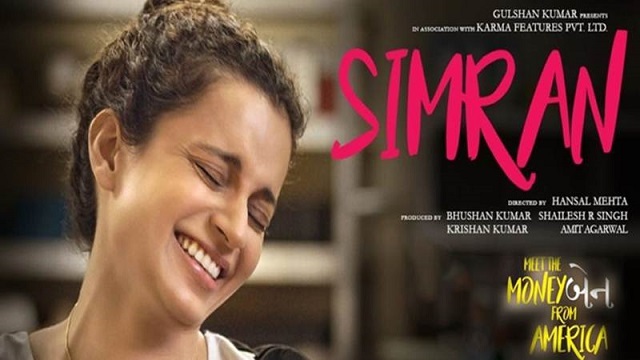 Simran is a bold movie in the sense that it does not shy away from portraying a badass leading lady, who lives by her own set of rules and possesses an undaunted spirit. Despite its extremely strong premise and the presence of a highly talented actress like Kangana, the movie falters somewhat because of its poor writing. However, its various flaws notwithstanding, Kangana keeps the audiences glued to their seats. We at IndiaCafe24 give Simran a rating of 3.0.